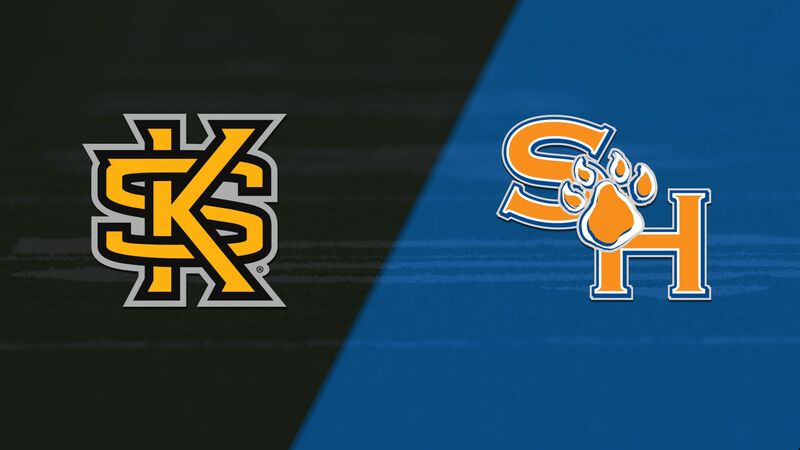 Sam Houston St. beats Kennesaw St. 34-27 in FCS quarterfinal - College Football - Are You Watching This?! 86-J.Thompson extra point is good. 3-C.Burks complete to 8-T.Reed. 8-T.Reed runs 23 yards for a touchdown. 39-T.Honshtein extra point is good. 16-J.Briscoe complete to 9-Y.Louis. 9-Y.Louis runs 15 yards for a touchdown. 3-C.Burks runs 4 yards for a touchdown. 39-T.Honshtein 21 yards Field Goal is Good. 86-J.Thompson 34 yards Field Goal is Good. 86-J.Thompson 28 yards Field Goal is Good. 6-C.Avery runs 1 yard for a touchdown. 34-R.Bulmer runs 8 yards for a touchdown. 39-T.Honshtein 22 yards Field Goal is Good. 16-J.Briscoe complete to 9-Y.Louis. 9-Y.Louis runs 16 yards for a touchdown. 16-J.Briscoe complete to 81-N.Stewart. 81-N.Stewart runs 61 yards for a touchdown. 33-D.Holland runs 13 yards for a touchdown. 83-J.Genovese kicks 65 yards from KENN 35. 87-J.Harris to SHS 33 for 33 yards (25-J.White).